The other day, my fiancé, Arturo, and I ventured out to Penticton from Kelowna, BC. I’ve been to Penticton many times before but this time we only had three things on our to do list. Eat at Burger 55, visit Bad Tattoo Brewery and find some amazing street art. Even though I had been to Penticton before, I hadn’t realized there was so much urban art to be found. I was starting to miss all the incredible installations of street art in Mexico City and so I looked up online where I could find some Urban Art in British Columbia. The information I found online showed me that Penticton did indeed have some cool installations of street art but it was hard to find out where all these pieces of urban art were hiding. Well, I’ve done some exploring now and am pleased to give you this handy colorful city guide to Penticton! Main Street and Front Street are the two hottest spots for street art in Penticton. Many of the pieces are fairly spread out or down alleyways that break off from these two streets, but there’s plenty to be found, including the one pictured at the top of this article. This mural can be found after walking through the tunnel-like alleyway adjacent to The Book Shop on Main Street. This Owl painting was also right behind The Book Shop, you just have to walk through the alley beside it to get there! This one is also behind The Book Shop! Did you notice this little cat with antlers in the painting above? The downtown area of Penticton is quite small. Aside from Main and Front Street, take advantage of alleyways and side streets. Even when you’re not super close to either of these street art hot spots, you can still find plenty of art in alleys and on the sides of business buildings. Those are some pretty good looking robots if you ask me. I saw this piece under an awning on the outside of what I think was a closed restaurant and I love how jazzy it is! Alleyways are seriously the best places to find hidden art. This painting is located on the outside of the Ooknakane Friendship Centre. If you haven’t eaten at Burger 55, then you basically haven’t lived. This piece is on the side of the restaurant building. Penticton is full of color if you choose to look for it. It’s not all about the murals though. There’s also plenty of colorful buildings to enjoy. I think what I loved more than the murals and the colorful buildings though, is the Kindness Meter we found. Basically you put some change in and the money goes to help Penticton’s homeless population. Plus it was also super colorful and eye catching. More cities need to have these. This is probably the most colorful and fun looking staircase I’ve ever seen. Have you been to Penticton or elsewhere in British Columbia before? 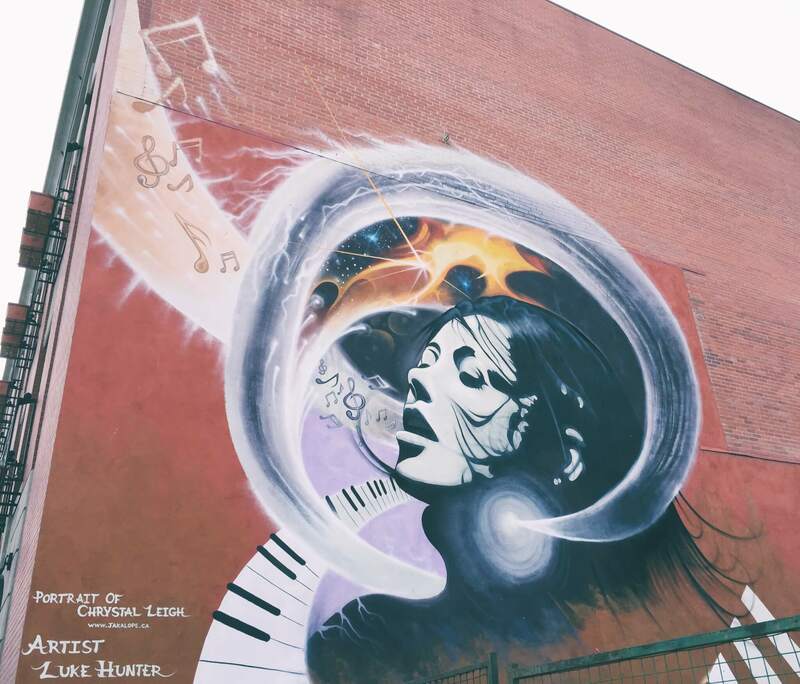 Where was the best street art you’ve seen in BC? Let me know in the comments! Planning a Trip to Penticton? Get the Best Deals Below! This art is beautiful! I wish we had more of this in my town. I absolutely love street art! I appreciate learning about the great places to find it in BC. The artists are really talented and you captured their work well. I love all of this artwork! They have just started doing more murals locally and I really enjoy seeing them pop up.